Donut County is a game with a really good idea which doesn’t fully capitalise on that idea. The result is a fairly middle of the road game; one you won’t regret playing the entire way through but one that is tough to recommend considering how many better games there are out there. 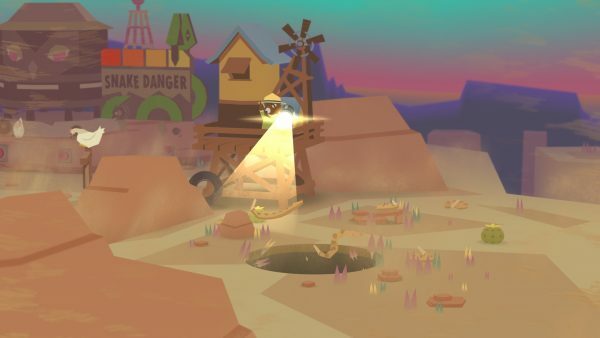 The game is about a racoon that is part of Donut County who supposedly delivers donuts to people - however the racoon is mistaken and delivers a hole to people instead, inadvertently trapping people underground as a result of this. You play back each scenario of how the villagers got trapped. The writing is fairly decent with some funny lines, although it does tend to wear a bit thin with its humour. That being said, the writing is never bad but simply tends to lose its impact over time. The story is similarly decent and inoffensive. You play as the hole and move around, swallowing objects and as a result, the hole gets bigger meaning bigger things can fit inside. There is a twist to each level but sadly these twists are shallow, meaning there are a fair amount of missed opportunities. This is a big problem since it just masks how repetitive the game is. Each level plays the same with the only difference being whatever twist is involved. Each twist goes anywhere between decent to fairly dull but each level as a whole is only serviceable for entertainment and since these concepts are rarely built on, even the best twists don’t have a ton of impact on the game. Some twists are built on or reused with the last third being slightly weaker than the first two thirds. For each level completed you get new entries in the trashopiedia, an encyclopaedia but from the raccoon's prospective. This a mixed bag with some funny entries and some not so great entries where it talks about items as if they are garbage but, like with most of the game’s writing, it wears thin. Graphically it’s not intensive but it does have a decent artystyle with a fairly cartoony look with mostly bright colours which works well with the type of game since it is light-hearted. The music also fits rather well with the type of game and there are some great parts of the soundtrack. Performance is absolutely fine with no noticeable framerate dips on a PS4 Pro but that is to be expected considering the fact that it’s not graphically remarkable in any way. The game’s length is about two hours and it does suffer in the last third. It's never really dull but, apart from the first few levels, the levels rarely are above serviceable and a fair amount of them are somewhat dull. And that is the game as a whole. It’s not a bad game but it’s a game that flirts with mediocrity fairly often. When it’s not flirting with mediocrity, it’s simply stuck in adequacy and, taken as a whole, it’s unremarkable. Like I said, it’s okay - it’s pretty average. It’s something that is fun enough and gives what you'd expect, but when you finish the two hour story, it won’t take many more hours until you forget about it.